a thousand times we changed captains. we went full ahead, through everything. we have the Great Chief, the Sun. This entry was posted on Friday, December 21st, 2012 at 4:58 pm	and is filed under History, Poetry, Science. You can follow any responses to this entry through the RSS 2.0 feed. Both comments and pings are currently closed. I like the notion of the sun as a great chief. Orion is one of the constellations whose star colors you can see with the naked eye because they’re so bright: most prominent among them are the red supergiant Betelgeuse, blue Rigel (actually a triplet of blue-white giants), and the central “star” of the sword which is in fact the famous nebula, a birthplace of new stars. Thanks for sharing this, it’s a fantastic photo. That’s a beautiful photo- Orion is one of my favorite constellations, being easily recognizable and bright, colorful stars. (-: My middle name was actually named for this constellation. On an unrelated note, I think I may have found the silliest example of the assumption the genes determine higher-order behaviors like intelligence and musical talent etc. I have been reading the book Interstellar Travel and Multigenerational Spaceships, a collection of papers presented at the 2002 AAS symposium of the same name. Most of the papers are quite interesting, and a number are devoted to social and reproductive issues of multigenerational space travel- except for one written by the SF author Joe Haldeman. Joe Haldeman wrote a paper on the reasons why we might engage in interstellar travel (all he came up with were doomsday bombs and nanotechnology plagues etc.). He then made the peculiar claim that by the time we could build a multigenerational starship, we will also know how to genetically engineer a fetus that will develop into a boy or girl who hungers to become a sanitation engineer (or any other necessary task, depending on the exact manipulations we conducted on their genes). Thus, we won’t have to hand down the knowledge over the centuries as in SF novels- just store some blastocytes-in-waiting with their career choices already planned out ahead of time. This quite possibly takes the cake- genes don’t just determine basic personality traits in Haldeman’s opinion, no, we can determine your career choice by genetic engineering!!! Sanitary engineer genes- egad. D,: The main insight I came away with is that SF writers should NOT be allowed to write papers for scientific symposiums- unless they do their homework first. I have no idea what this nonsense is doing sitting next to papers by Geoffrey Landis and Robert L. Forward. I suppose the biologists kicked it out of the Anthropology, Genetics, and Linguistics section, but the engineers still wanted a “popular SF writer” angle or something. So of course you know we have to ask: what is your middle name? Haldeman is another of the pseudo-sciency “hard SF” leadenfooted writers. Astrobio conferences pull this stunt routinely, to the serious detriment of their credibility. My full name is Christopher Orion Phoenix, with the middle being for the constellation Orion. (-: My parents favored this particular constellation and chose my middle name for it. Haldeman writes “military” SF, doesn’t he? I ran across one of his stories in an anthology of Analog SF’s “best” stories (well, one or two were okay…), but didn’t bother to read past the first page or so (guns- bug aliens- booring). What I’ve seen of “MSF”, I do not like- the genera glorifies violence and simply projects 20th century military culture into space. The main “message” of the genera seems to be that aliens are bugs, and we must shoot them to get the resources. The best attribute a SF writer can have, I think, is the ability to imagine beyond the limitations of their cultural context. As we are a society that gets energy from dead plants, dumps waste in our own oceans and land and atmosphere, and leaves many of our population starving, undereducated, and subject to abuse and even murder due to differences of gender, race, or creed, I don’t think we have much insight into how a truly cosmic civilization will think and live. Do you know Adrienne Rich’s famous poem about your namesake? It’s very beautiful. While Haldeman, a Vietnam vet, writes uses tropes from military SF, his most famous book, The Forever War, is a blistering reversal and critique of Heinlein’s Starship Troopers. (Spoiler alert ) In it, the war against “the bugs” turns out to have arisen from a ghastly misunderstanding. Now that you mention it, that title does come to mind as his major work. But genes for career choice, ixnay. No, I did not know Adrienne Rich’s beautiful poem “Orion”. Thank you for sharing the link to it, Athena!! I have not read much of Joe Haldeman’s work, so I cannot discuss it fairly. To be honest, I have not read much military SF. The main point I have to criticize him on is that he veered straight into pseudoscience in his paper for the AAS symposium on interstellar travel. This just shows that Haldeman read Huxley’s Brave New World, which I think is how dystopian tyrannies will actually happen or close to it rather than via Orwell’s Big Brother world of 1984. Set up a global society where everyone is watched and most all infractions are severely punished and you will only breed a strong vein of resistance. Think of the 1921/1924 novel We by Yevgeny Zamyatin, which Orwell was no doubt quite influenced by. But give everyone every base pleasure and make too much thinking seem uncool and you will have a society dependent on those who make the things of joy and coolness. You can then manipulate people as you will and they will willingly go along to remain happy and socially acceptable. Because there is nothing worse to a social animal than not feeling or being part of the group. I wonder if an intelligence can arise without the need to do with a whole bunch of others in the process? I know socialization has worked on this planet in terms of making its smartest beings, but is this the case across the galaxy and beyond? If so, does that mean everyone is pretty much like us? Is that why SETI has yet to succeed, in addition to its sporadic and limited nature and the fact that the Milky Way is huge and old and expecting such a program to pick up a signal in just fifty-plus years is absurd? Gee, I wonder why I have never seen this quote before? Not. Good ol’ Philip K – he may have come across as a paranoid nutcase, especially towards the end, but he made a lot of sense and wrote more meaningful SF than many of his contemporaries. And he obviously had an annoying streak of honesty. Of course not every SF writer who goes “hard” was ignorant of science or a bad writer. Isaac Asimov was a very smart guy who knew his science and could write passable literature. His nonfiction explanations of science to the masses were pretty good, too. At least I felt they got the job done. As one finds when it comes to science popularization, most real scientists cannot convey their work to the masses, just as most writers are not scientists. One from the former category was Robert Forward. Do not get me wrong, Forward was a nice guy who I had some correspondence with; he encouraged my writing. He was also pretty good when it came to science and technology. However, his fiction was mainly a vehicle for promoting his science ideas. Much of it was not very good and his characters were particularly terrible. I do not say this lightly or with any intent of malice, please note, I am just being honest. The man at least had the virtue of making some truly mind-stretching ideas (intelligent life on a neutron star, for example) and you knew he had done his homework. At one time science fiction was amazing and daring enough just by existing and daring to make us imagine we could actually fly to the Moon or live in a world run by smart computers or claim that other planets with alien beings existed. If the writing actually matched up with the fictional audacity, so much more the amazing. Of course that phase has largely run its course, though there are still plenty among the masses for whom anything outside their daily pedestrian lives is too much or too seemingly silly to bear both intellectually and emotionally. So maybe that is why we still have hard SF that feels like it was written in the 1930s, with long diatribes on technology and physics and characters that are an insult to cardboard cutouts. That whole caste system based on the first five letters of the Greek alphabet, where Alphas are the smart leaders and Epsilons are the literally conditioned morons who do the basic drudge work of the future dystopia. While we may not go to quite the extremes that the World State in Huxley’s novel does to make people a certain way to do certain things, we certainly have been doing our best to achieve something similar for centuries now. We also have the example of India, where there are literal castes and ones such as the Untouchables are literally forced by society to do to the literal dirty work. Stepping outside your caste isn’t just frowned upon, you can be killed for it. And their main religion maintains the clever conceit that those born into wealth and power earned it from past lives, whereas those born poor or otherwise lowly came from past lives where they were criminals or such, thus they deserve to be at the bottom of the social rung, where maybe they can earn a better place in life in their next life. There was a throwaway line in the television series The Big Bang Teory where Raj tells one of the gang that Americans foolishly give hope for a better life to their poor, unlike in India. It was said as just another joke, or so it seems, but I think there was a lot of truth to this in terms of how India and most other cultures treat their citizens. America does proclaim that it is the land of opportunity, but how many really achieve it, especially these days? I have to disagree with you on Asimov, Larry. He was a terrible stylist, his characters were cardboard, and he was also a well-known pincher in cons (other male participants and coordinators told the few women present that this was a signal honor — and they even incorporated it into the official announcements). Athena, note I was not praising Asimov for his behavior towards women or that he was a latter-day Shakespeare. I was merely using him as an example of an SF writer who did know his science. Compared to other SF writers, at the least I did not find him painful to read concerning his short stories and nonfiction. However, I cannot get through even the first of his Foundation Series despite several attempts. Perhaps I should have used Stanislaw Lem instead as an example, who was trained as a doctor and a much better writer and far better philosopher. He also pissed off the American SF community by saying most of their work was lighthearted dreck. I agree with Walden2. Asimov’s non-fiction, science writing was very good. I would argue that he wrote the clearest, unambiguous explanations bar none. His fiction was not good, although I think his robot stories are/were very entertaining. I’m still waiting for someone successfully to take on his mantle as a science writer. It’s a pity that’s not his claim to fame. As for science writers, they do exist but now they’re almost invariably fragmented by discipline. George Orwell”s 1984? I’m reading that book right now. The bizarre, and truly frightening, aspect of the Big Brother’s totalitarian rule is that it isn’t just your actions and speech that are punished, but thoughtcrime- thinking against Big Brother and his rule. It doesn’t matter what you did or did not do, it was the Thoughtcrime that condemns Winston from the beginning, even before he opens his diary. Then, of course, there is Doublethink and Ingsoc etc. More mental techniques. The final goal of Big Brother’s regime, however, was to constrain the consciousness of the people by switching them over to Newspeak, which contained vastly fewer words than ordinary english. Once you no longer have the words freedom, peace, war, rebellion, etc. the concepts will vanish from people’s minds. I can’t help wonder if people are doing this already voluntarily with the arrival of internet culture. *is only half in jest* I see a vanishing vocabulary, less and less attention payed to proper grammar, and hardly any meaningful communication. Nor does anyone care whether what they say is accurate. I was recently accused of being a “history Nazi” for pointing out that the Aztecs, not the Mayans, conducted mass human sacrifices by ripping out the heart, and told that this is worse than being a “grammar Nazi!! As though pointing out an inaccurate statement or a spelling error is equivalent to committing mass genocide and war crimes. To be honest, even in person I have been accused of being too exact- but this is a trait well suited to science. As for Isaac Asimov- I’ve read the first of his Foundation series, and frankly found little to be excited about. Asimov’s “galactic empire” lacks any color, culture or vitality. No planets are described in detail, save Trantor, which is all indoors anyway. There are no animals other than humans, virtually no female characters, and plot except the political machinations of various leaders. Giant spaceships and hand blasters have been common in SF since the 1920’s, so nothing new there. I finished it, but I’m not planning to read the rest of the series. Should humans colonize the galaxy, undoubtedly we will develop many- perhaps thousands- different cultures as each new group finds a new niche in the cosmos. Humans may even speciate into different manners of people, either intentionally through genetic engineering and cybernetics, or simply due to being isolated in different environments for long periods of time. By the time a large number of stars have been settled, humans won’t dress the same, look the same, or talk the same- we may even have split into several different species. This, perhaps, could be one of the best results of interstellar colonization- countless new ways of life and genetic lines will be free to develop, so our descendants will be truly diverse. I find it impossible to imagine any real galaxy could be so featureless and void as Foundation shows, and no human society could be either. Nor can I swallow the sheer scale of Asimov’s bloated Roman-esque empire, with billions up billions of inhabited worlds yet only one apparent galactic culture. And, the hook for the stories, Seldon’s “psychohistory” and the thousand-year plan, doesn’t ring true to me either. A single mathematician, predict the behavior of all humans throughout an entire galaxy? I guess that human populations behave chaotically, overall, not in a mathematically predictable manner like the orbit of a planet. I can’t help but feel a bit like Asimov told us in a grave and serious manner that a brilliant physicist, realizing that the Earth was going to fall into the sun, created a “thousand-year-plan” in which humans will jump up and down at a certain time during the day in order to move the Earth and avoid catastrophe!! I would’t be a bit surprised if psychohistory is as silly as that from the perspective of a sociologist. I’ve read some of Stansilaw Lem’s fiction, starting with Solaris, and I am currently partway through Return From the Stars– one of his best books, in my opinion. He liked to play with the scale of the cosmos in relation to normal human affairs, and he had a very lively imagination- just read the opening chapter of Return From the Stars!!! I rather like his work. I noticed that Lem did not trumpet the inevitability of the colonization of space and the idea that astronauts are all square-jawed fearless heroes like some American SF stories did. The society that developed on Earth after betrization was invented (a process that chemically neutralized aggressive impulses) lost all interest in space travel, although the invention of parastatics (control over inertia and gravity) meant the space travel would become much easier!! Hal Bregg is by no means a square-jawed fearless rocketman, but instead a fully developed human who finds himself a social anachronism literally lifted out of one era and dropped into another. The same concept underlies Minority Report: people are punished according to intent, not action. It’s the same “logic” behind the NRA President’s suggestion of creating a national register of “the mentally ill”. 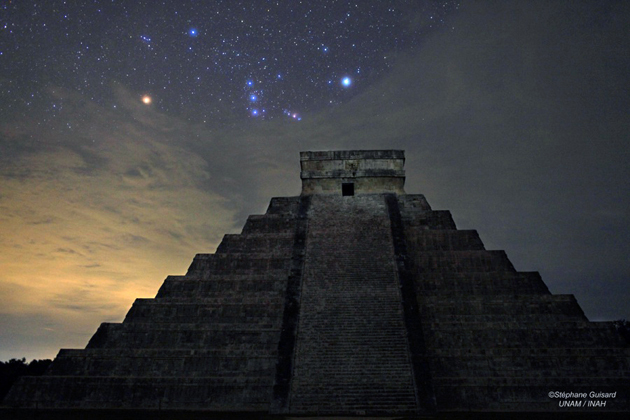 The Mayans performed human sacrifice as well, but less so than the Aztecs. They resorted to bloodletting instead. Also, their preferred methods differed from those of the Aztecs: death was usually by drowning, in honor of Chac, the rain god. The Aztecs used god-specific methods as well: heart extraction for Huitzilipochtli, flaying for Xipe Totec, etc. And both cultures sacrificed children as well as captive warriors. Asimov’s Foundation is the quintessential “novel of ideas” by the SF/F definition of the term. Which means that the less said about style, plot and characterization, the better. Let’s face it — even Hari Sheldon was a featureless cardboard cutout. @Christopher – When reading the Foundation series, it is a mistake to use a contemporary lens to analyze it. Genetic engineering, chaos theory – all unknown then. There are female characters, but again the audience for SF at the time was mainly male. If you have ever read any of Gibbon’s “Decline and Fall of the Roman Empire” on which it was based, it is also very dry, male, and lacking in any cultural details even though the empire spanned many cultures. While the science of psychohistory is very unlikely, it has inspired economists (Krugman) and politicians (Gingrich). And how many social sciences try to emulate predictability with math today? I don’t think anyone ever thought the series was going to be a durable “work of Art”, although it has stayed popular if reprints are any indication of demand (last reprint was 2008?). If the Foundation series fails for stylistic reasons, well it has already been suggested that Asimov wasn’t a very good fiction writer, and SF writers have had 60 years to improve their skills since then. Alex, would you care to have me list names of Asimov’s contemporaries (or who preceded him) who wrote beautifully? Even some within the SF/F genre? The argument “he was a man of his time” is used too frequently and sloppily to excuse basic failures of craft (leaving mindset aside). People keep saying “Oh, Tolkien was ‘a man of his time'”. Except that Virginia Woolf, who was ten years older than Tolkien, wrote her incandescent condemnation of fascism, Three Guineas (sixty years before the concept of “intersectionalism” came into fashion), two years after Tolkien wrote… The Hobbit. Gorgeous image, and wonderful, evocative poem; thanks for sharing both. @Athena – surely the point is that there wasn’t much SF that was well written from a literary standpoint. Indeed the recent influx of literary writers entering the SF genre seems to indicate that there is still a perceived gap. Then of course there is the issue of what the readers want. It is certainly arguable that readers who want ideas wrapped in story are getting those ideas diluted with richer characterization and plots. Chacon à son go?t. For well written SF, in a similar vein to Foundation, I personally liked Stapledon’s “Last and First Men”, (pub 1930). (But I read it a long time ago). I don’t really understand your point about Woolf vs Tolkien. Isn’t that like complaining that most writers cannot achieve the quality of Shakespeare’s works, hundreds of years after his death? (or whoever wrote the works attributed to the glove maker). Alex, that depends on your definition of SF. If it was/is “Asimov, Clarke, Heinlein” the conclusion is guaranteed to be the one you want. You may have noticed I did not compare Tolkien to Shakespeare but to “lesser” im/mortals. Please don’t engage in Thinks-It’s-Logic 101 sophistries. The point was that Tolkien was regressive self-consciously and by choice, not “a man of his time” and that plenty of his contemporaries wrote speculative works that were sophisticated in both content and style (Woolf herself wrote an SF/F novel: Orlando). More of this very soon, as I’m about to put up a relevant article. However, in 1984, the crime isn’t intention to commit a crime (in fact, there are no laws against actions in Oceania), but simply holding an belief other than that the Party considers orthodox (in Newspeak, crimethink). This means any unorthodox thinking- even remembering when the Party deliberately lies to you. The position of the Party is that there is no objective reality, only the perception of the mind, and they control the populace’s mind, thus they control reality. Disturbingly, both “mobile truth” and doublethink do seem to exist in the real world. If I work for a corporation that states that its product is better than any of its competitors, and I accept this without questioning if it is true, then the question of whether this true in ascertainable reality becomes irrelevant. Doublethink, the power of holding to contradictory beliefs in your mind while accepting both, has historical examples as well. Consider what the US called the “free world” during the Cold War- various dictatorships in South America and elsewhere were included because they were against the Soviets, even though we knew they were not states with political freedom!! On one hand, we call them the free world, on the other we know they are in fact dictatorships- but we held both contradictory statements in our mind while accepting both. @Alex Well, Foundation is so “of its time” I’m not bothering to read the rest of the series- and that is a poor excuse for a boring piece of fiction. I’ve read other old SF stories, and some of them are far better. I knew that the Mayans conducted human sacrifices, but the reference I responded to was clearly talking about the Aztec sacrifices to their Sun god (the ripping out of hearts etc. ), and was incorrectly attributed to the Mayans- but, as you said, the Mayans sacrificed people as well. The Aztec priests were known for blood-letting, too- they were covered in scars and dried blood, if I recall correctly. @Christopher – I agree “Last and First Men” is very different from the “Foundation” series, but I couldn’t think of a novel that was antecedent to Foundation, better written and with a historical theme. Perhaps you can do better. It is OK that you find Foundation boring. Everyone has different tastes. But I think it is fair to assume that if publishers are reprinting the novels, that people are buying and reading them. Maybe they are all bored by the material, but I expect not. Regarding gene engineering of humanity. Stapledon was working only with the solar system, and recall that the last men (18th?) on Neptune were waiting for the sun to destroy them. (He used a bigger canvas for Starmaker). Asimov simply assumed FTL spacecraft and a plethora of habitable worlds. [Somewhere in the novels, many worlds have lost the ability to make atomic power, which means to me that their ships must have been powered by fossil fuels! ] The Foundation series assumes the same type of habitable worlds universe as his robot detective stories. Given the interest in habitable, extra-solar worlds right now, and the talk about human visits to those worlds in the future, is not our contemporary thinking about these worlds and colonization waves basically the same? (but without the FTL needed to make this a “galactic empire”). Aren’t you shifting the goalposts a bit, Alex? “People are buying it” is different from “It’s good” especially given the liking of publishers for safe bets. @Athena – no I don’t think so. If readers found Foundation boring and unreadable as Chris does, they wouldn’t keep printing the novels. That isn’t the same as saying it is good, in the literary sense. The thrust of my comment to Chris was that Asimov’s “universe” is possibly less of its time that was implied. The writing style, that I think we all agree on, was not great. If people continue to call Asimov et al “classics”, people new to SF will continue to buy them as entry points — and publishers will continue to print them. I see no real point of comparison between Olaf Stapledon’s Last and First Men and Isaac Asimov’s Foundation. Stapledon’s work was filled with ideas about future technology, life on other planets, and human evolution beyond our current form, but had no “story” other than that of the human species as a total. Foundation was a SF version of Gibbon’s Decline and Fall of the Roman Empire set in a ‘verse with many of the basic ideas in E.E. “Doc” Smith’s Skylark and Lensman novels but no aliens. The two stories really had little at all in common. I don’t recall any politics in Last and First Men, and no named characters, while Foundation consisted entirely of political intrigue between named characters (well, men, actually) who had little to their personality other than a name. My main complaint with Foundation is that there is little beyond the political intrigue in the story- no decent world building, no human interactions, no animals other than humans, no flights to unexplored space. Overall, Foundation resembles Trantor’s endless bleak metal horizon- utterly uniform, with nothing to break the monotony and everyone living anonymous lives in compact metallic cubbyholes. Given the interest in habitable, extra-solar worlds right now, and the talk about human visits to those worlds in the future, is not our contemporary thinking about these worlds and colonization waves basically the same? That’s an interesting question- on the Centauri Dreams blog I recall a blogpost mentioning that while a lot of people have imagined ways to reach the stars, not much thought has ever gone into how we would found a star colony. For many, the assumption does seem to be that there are habitable planets elsewhere on which we can live. Don’t forget, though, that in his setting Asimov was not particularly original- E.E. “Doc” Smith and others had already filled the galaxy with habitable planets two decades earlier. I don’t think it is unreasonable to suggest that there are many other planets orbiting distant stars with the proper surface conditions for humans to live unprotected, but what about other concerns? What do you think, Athena? If we found a planet with a surface temperature, gravity, and atmospheric pressure and oxygen content inimical to human survival without spacesuits, and there were no obvious hazards, what would our protocol be for exploring the place? Generally, the idea with a habitable planet is that you don’t have to bring lots of equipment and materials like spacesuits and oxygen bottles in order to survive- but if humans can live there, undoubtedly many other forms of life do already, and what about biological contamination? Biochemical incompatibility? Toxic substances our orbital surveys failed to detect? Dangerous organisms? This fellow named Kelly Starks, who wrote a webpage on a design study for interstellar exploration ships (you can find some links to it here) is convinced that so much as sitting in the same room with an alien daisy will unleash the equivalent of the Ebola virus on the hapless astronauts, so he declares the astronauts must wear hard suits and that anyone who is exposed to the environment will be left for dead in the mission profile page. This seems rather silly to me- diseases like Ebola are adapted to attack certain hosts, of which humans happen to be for Ebola. They can’t infect trees, which are far closer to us both biochemically and evolutionarily than hypothetical alien organisms will be. I never caught powdery mildew, even when I tended to an ailing squash plant affected by it. If I can’t give the common cold to a lettuce planet, why would a disease from an entirely different order of living things suddenly find a human to be the prefect host? It could be that our respective biochemistries are so different that alien microorganisms will find humans to be pure poison, so that they starve. I don’t know for certain, but I doubt that habitable extrasolar planets hold any greater dangers than Earth does for us already- possibly less in regards to diseases and parasites. Here on Earth we are afflicted by organisms adapted over the centuries to attack us, but on another planet we may be regarded as inedible poison by the local life. Beyond the questions about a planet’s suitability to human life, you must also be sure to bring enough colonists to ensure genetic diversity and build enough infrastructure to support a technological civilization at your new home. All in all, I don’t think that enough thought goes into planning out how we might find and settle extrasolar planets- it isn’t just getting there that counts. Almost zero systematic thought has been given to founding a colony on another earthlike planet; the closest we have is Zubrin’s Mars Direct plan. There’s no question that the friendlier a planet is to us, the likelier it is to have its own native life. We have zero protocols for that, and given our past behavior destructive interference is almost guaranteed. Viruses from an independent life genesis will not recognize terrestrial hosts unless there is a fast cascade of mutations (equivalent to the HIV metamorphosis). But even then they would have to be closely related to begin with. But they could kill us simply by being toxic, as we could be toxic to them. Happy New Year, Athena!! (: I’m surprised there has been so little thought given to protocols for exploring and settling an earthlike planet, given the interest in habitable extrasolar planets in real life and SF. I would have thought someone would have brought this up at the 100YSS symposium. The questions of how we should define habitable, how common habitable planets might be, and how we should go about exploring such planets not to mention the ethical considerations of interference in native alien ecospheres should be of intense interest to anyone interested in interstellar flight. The only discussion of earthlike planets as the destinations of star travelers I’ve found is Stephan H. Dole’s Habitable Planets for Man, which was published in the 1960s and is probably somewhat out of date. Stephan assumed that we could deal with “primitive” life forms, but stated that we should stay off any planet inhabited by intelligent beings, to avoid unethical interference and conflict with them. So, you think that biochemical incompatibility is more likely to be a problem for us than infection? We should send down a small robot probe to check the environment for toxic substances first, then!! I am a little alarmed at times by the “manifest destiny” aspects of space colonization, even though I think that expanding beyond our planet is a desirable goal. When it comes to inhabited worlds, I would prefer to look, walk lightly, and leave nothing but footprints- not try to turn it into a bunch of cities and suburbs. Happy New Year to you also, Christopher! To be fair, the topic was part of the 100Yr Starship Symposium. But most of the thoughts on settlement were half-baked or bizarre. Among them was the suggestion to send frozen human embryos that would be hatched and reared by robots. “Not even wrong” is the verdict for that one.